Every National Day, Doggie Wardrobe would try to start a charity drive to aid needy fellowman! This year, we will be reaching out to help our native local dogs -- the Singapore Specials aka Strays. We visit the Vets quite often for our dogs' treatment, and we seldom see any Singapore Specials there. We were wondering,what happens when they are sick? Who's caring for them? Most of the Singapore Specials do not have a roof over their head and we often read about them being culled and mistreated. Luckily Project JK is around to help them, but financially, we need your help! Everyone of us here have limited resources to help them, but if everyone chip in a little, we can help by sponsoring their sterilization fees / vet treatment fees. 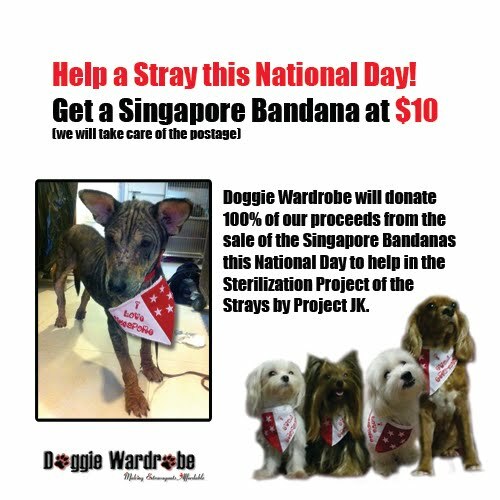 In this 2 months - July & August, Doggie Wardrobe will pledge our stock of limited edition Singapore Bandana to chip in to the sterilization & treatment program with Project JK. Each bandana will cost $10 and all of the $10 will go to the strays' sterilization fees & Vet treatments. We will fork out for packaging & postage! We will advise a size for your dog (We have S, M, L) and payment details. All Donors would be listed on this page to keep track of donations. Your contribution, however small, will definitely make a difference to our Singapore Strays! Project JK - Just Kindness has been on the streets for our strays since 2004. We've been helping an elderly strayfeeder along her route - mainly to catch, sterilise and release/relocate/rehome our homeless strays. Along our journey, we have met many sick, injured and abused strays. With your support, we will continue to make time, to show kindness to those we are destined to meet. We believe that every act of kindness makes a difference. Thanks for all the generous contributions!